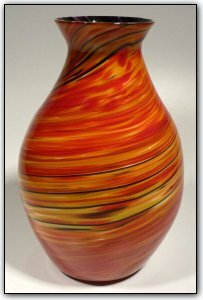 This gorgeous vase's exterior features shades of red, black, and topaz all swirling around. The interior features a lovely combination of dark purple and black. This is such an eye-catching combination of such vivid colors just about jumping off the glass! Also make sure to check out the matching bowl with the exact same color combination. If you purchase both of them together, the artist has offered a 10% combination discount on the matching set.